Hawaii senior Kristi Yoshizawa returned to her spot behind the plate this season after playing third base in 46 games last year. And to have three perfect games in a season, involving three different pitchers, is nothing short of amazing. Kristi Yoshizawa had the best seat in the house for all three of the impressive performances turned in by a young trio of Hawaii softball pitchers. The senior catcher was behind the plate for every inning but one, as freshman Justine Smethurst, and sophomores Jessica Morton and Kate Robinson were untouchable. "In all my years of playing, I can't remember anything like a perfect game that sticks out," Yoshizawa said as the team prepared for its critical series at No. 3 Fresno State starting tomorrow. "And now we have three. "Our team is really good. I'm really excited about playing Fresno -- and I'm nervous at the same time. We're both in first and whoever wins this is guaranteed first place. We're ready to go." The Rainbow Wahine (23-14, 7-1 Western Athletic Conference) have a half-game lead over perennial power Fresno State (28-13, 6-1). Not only will Hawaii have to prepare well for the always-tough Bulldogs (17-1 this season at home) but for a long road trip; after the three-game series with Fresno State, the Wahine have a doubleheader at St. Mary's on Tuesday then are at Nevada for a three-game WAC series April 28-29. Yoshizawa knows a thing or two about travel. Hawaii is her third college; the Rancho Cordova (Calif.) High product started her career at Sacramento State before transferring to Sierra (junior) College and then to Manoa last season. She's also playing her second position for the Wahine. Yoshizawa was at third base for 46 games last season, and caught once, against Central Florida. "I've always caught on most of the team's I've played on," said Yoshizawa, an all-conference player in both softball and basketball in high school. "And the opportunity came up to catch here this season. I can't see myself anywhere else. "There is way more pressure at catcher, and it's way more intense, but that's why I like it." The move 60-feet down the baseline has translated into a move in Yoshizawa's hitting statistics as well. She's up to .299 from last season's .239, is first on the team in sacrifice flies and triples, second in sacrifice bunts, third in RBI and fourth in doubles. Yoshizawa also is fifth in striking out. "This year, she's very aggressive," UH coach Bob Coolen said. "She's more confident and that leads to her being more aggressive at the plate. "She doesn't have the blazing speed you'd want from a left-side hitter but she has enough. She's been finding a lot of holes deep in the outfield this year and that's a nice thing for us to have as a No. 7 hitter." Coolen has also seen Yoshizawa's leadership abilities emerge. "She quietly aggressive and takes charge when she has to," he said. "She knows the game, studies the hitters and understands the whole concept of setting up a batter. That's why I have no problem with her and Kaulana (backup sophomore catcher Gould) calling the pitches." UH's Kristi Yoshizawa has improved her batting average by 60 points this season. Yoshizawa has caught 33 of Hawaii's 36 games, committing no errors, and throwing out 11 of 12 base stealers. She's also on her second catcher's mitt, thanks mostly to the hard-throwing Smethurst. "Jus throws hard and that's why batters have a hard time hitting against her," Yoshizawa said of Smethurst (11-8, 1.77 ERA). "She can just blow it by almost anyone. I have a hole in my other glove. "I have a good connection with all our pitchers and they're all different. Jess (Morton) has the most movement and changes speeds really well. Kate throws a heavy ball so it's really hard to make good contact off her. "I think our pitchers have been doing a really good job. It helps me out when they're on because then I can call whatever pitchers to keep the batters off pace." Calling the pitches is Yoshizawa's favorite part of the game. "You're the one seeing everything so you have to be in control the whole time," she said. "So if there is a hit, I feel partly my fault because I didn't call the right pitch." The one call Yoshizawa regrets not making was coming to Hawaii first. Her father Glenn is a Farrington High graduate, her grandparents are on Maui and she has numerous relatives in the islands. "I wasn't ready to leave home," she said. "But coming here was like moving out of my house while still having comfort. I wish I had been here all four years but I'm trying to make the most of my last season. "I'm excited to play at Fresno for the first time. We're not afraid, we're ready, we're confident. We're just as good as them and we can beat them." The series at Fresno State will be the last of the season for UH assistant coach Dana Degen. 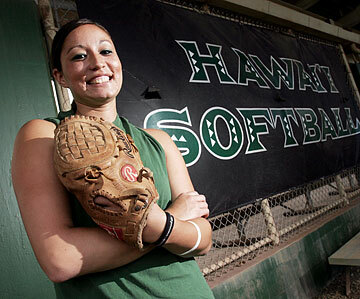 The former All-American catcher for the Wahine is resuming her pro career in Italy with Sanotint Bollate. The 28-year-old Degen was the starting catcher for Sanotint Bollate of the Italian Softball League before being hired in January as UH's battery coach. Volunteer coach John Nakamura, who retired last year as a part-time assistant, will have his duties expanded with Degen's departure.